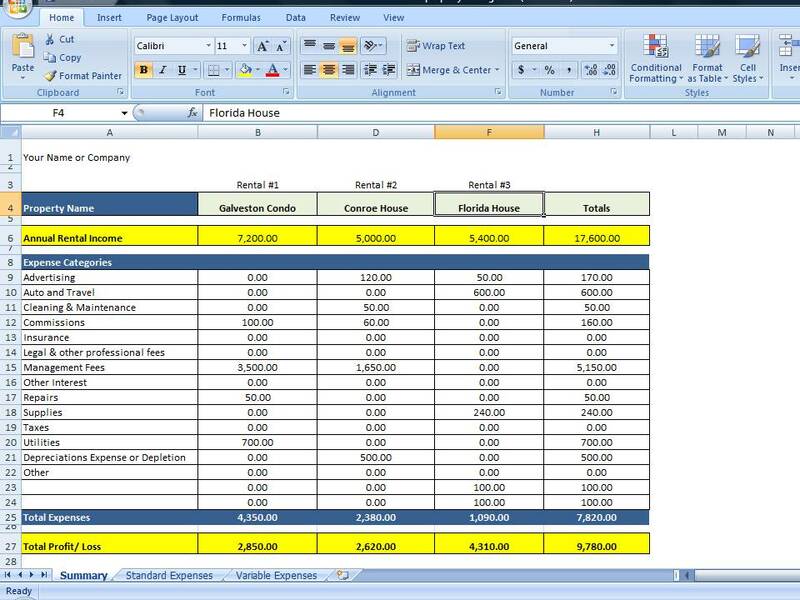 Whether you have 1 rental property or many, this spreadsheet template will help you stay organized and keep track of your rental income and expenses, making tax time a breeze! There are 3 spreadsheets within this file that are linked together, saving you time so you only have to enter your information once. The file has a place for up to 3 rental properties; however you can save different versions of the file if you have more properties to keep track of. Standard Monthly Information – This page is nice because you’ll be able to estimate your annual rental income and expenses, for those that are consistently the same each month. You only need to enter the monthly rent (or standard monthly expense) once and the file will automatically populate that amount for all 12 months of the year. If you raise the rent, you can enter an effective date and the new amount and the file will populate the months after the effective date with the new amount. If you have a rental change more than once with a year, you will be able to manually write over each month’s income (or expense). Variable Expenses – For expenses that vary from month to month, you can enter them into this spreadsheet. 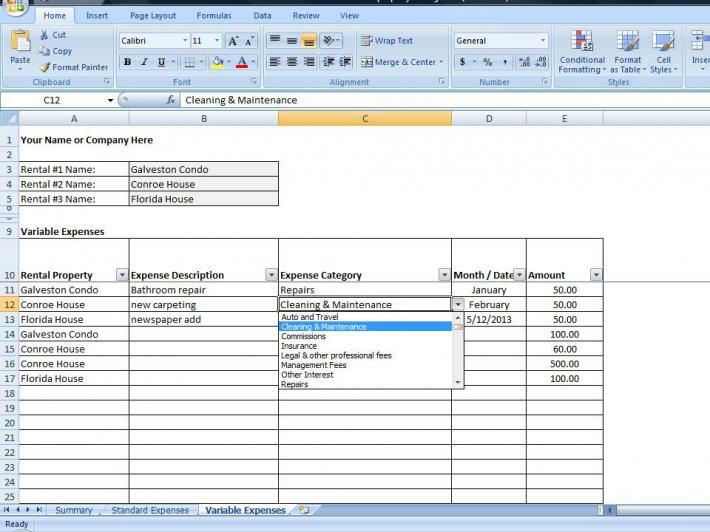 You will simply select an expense category from a drop down list. The expense categories available are the same as those listed in Schedule E.
Summary page – This is where everything comes together from the Standard Income/Expenses and Variable Expenses. The only information you’ll enter in this page is the property name(s) at the top of the page. All the expense categories will sum up the information that you’ve entered, as well as your rental income and total profit/loss. 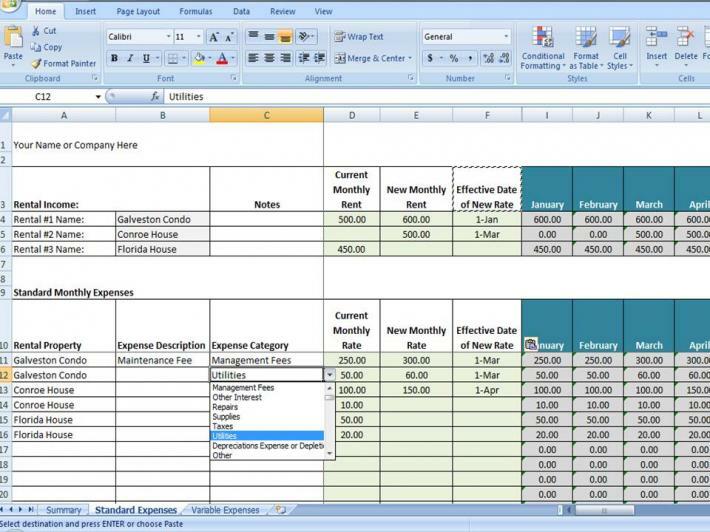 You will receive an Excel Spreadsheet and a PDF file with directions, MS Office 2007 version, but should work fine with other versions. This file is not meant to provide any type of tax advice. You will receive this by email. You won't receive a physical copy in the mail.